This article is about the entertainer. For other people of the same name, see Jerry Lewis (disambiguation). Not to be confused with Jerry Lee Lewis. 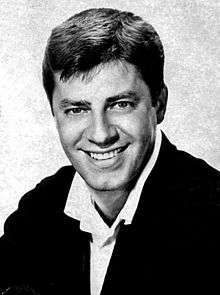 Jerry Lewis AM (born Joseph Levitch, March 16, 1926) is an American actor, comedian, singer, film producer, film director, screenwriter and humanitarian. He is known for his slapstick humor in film, television, stage and radio. He and Dean Martin were partners as the hit popular comedy duo of Martin and Lewis. Following that success, he was a solo star in film, nightclubs, television, concert stages and musicals. Lewis served as national chairman of the Muscular Dystrophy Association and host of the live Labor Day broadcast of the Jerry Lewis MDA Telethon for 40 years. Lewis was born on March 16, 1926 in Newark, New Jersey to Russian Jewish parents. His father, Daniel Levitch (1902–80), was a master of ceremonies and vaudeville entertainer who used the professional name Danny Lewis. His mother, Rachel ("Rae") Levitch (née Brodsky), was a piano player for a radio station. Lewis started performing at age five and would often perform alongside his parents in the Catskill Mountains in New York State. By 15, he had developed his "Record Act" in which he exaggeratedly mimed the lyrics to songs on a phonograph. He used the professional name Joey Lewis but soon changed it to Jerry Lewis to avoid confusion with comedian Joe E. Lewis and heavyweight boxing champion Joe Louis. Lewis then dropped out of Irvington High School in the tenth grade. He was a "character" even in his teenage years pulling pranks in his neighborhood including sneaking into kitchens to steal fried chicken and pies. During World War II, he was rejected for military service because of a heart murmur. 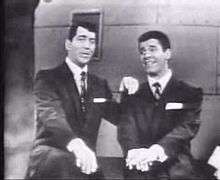 Lewis initially gained attention as part of a double act with singer Dean Martin, who served as straight man to Lewis' zany antics in the Martin and Lewis comedy team. The performers were different from most other comedy acts of the time because they relied on their interaction instead of planned skits. They quickly rose to national prominence, first with their popular nightclub act, next as stars of their own radio program. The two men made many appearances on early live television, their first on the June 20, 1948, debut broadcast of Toast of the Town on CBS (later as The Ed Sullivan Show). This was followed on October 3, 1948, by an appearance on the NBC series Welcome Aboard, then a stint as the first of a series of hosts of The Colgate Comedy Hour in 1950. The duo began their Paramount film careers as ensemble players in My Friend Irma (1949), based on the popular radio series of the same name. This was followed by a sequel My Friend Irma Goes West (1950). Starting with At War with the Army (1950), Martin and Lewis were the stars of their own vehicles in fourteen additional titles, That's My Boy (1951), Sailor Beware (1952), Jumping Jacks (1952), (plus appearing in the Crosby and Hope film, Road to Bali (1952) as cameos) The Stooge (1952), Scared Stiff (1953), The Caddy (1953), Money from Home (1953), Living It Up (1954), 3 Ring Circus (1954), You're Never Too Young (1955), Artists and Models (1955) and Pardners (1956) at Paramount, ending with Hollywood or Bust (1956). All sixteen movies were produced by Hal B. Wallis. Attesting the comedy team's popularity, DC Comics published the best-selling The Adventures of Dean Martin and Jerry Lewis comics from 1952 to 1957. As Martin's roles in their films became less important over time the partnership came under strain. Martin's participation became an embarrassment in 1954 when Look magazine used a publicity photo of the team for the magazine cover but cropped Martin out of the photo. The partnership ended on July 24, 1956. 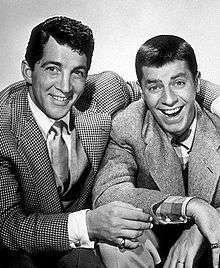 While both Martin and Lewis went on to successful solo careers, neither would comment on the split nor consider a reunion. They did however make occasional public appearances together up until 1961, but were not seen together again until a surprise television appearance by Martin on a Muscular Dystrophy Telethon in 1976, arranged by Frank Sinatra. The pair eventually reconciled in the late 1980s after the death of Martin's son, Dean Paul Martin, in 1987. The two men were seen together on stage for the last time when Martin was making what would be his final live performance at Bally's Hotel and Casino in Las Vegas. Lewis pushed out a birthday cake for Martin's 72nd birthday in 1989 and sang "Happy Birthday" to him, and joking, "why we broke up, I'll never know." After the split from Martin, Lewis remained at Paramount and became a comedy star in his own right with his first film as a solo comic, The Delicate Delinquent (1957). Meanwhile, DC Comics published a new comic book series The Adventures of Jerry Lewis from 1957 to 1971. Teaming with director Frank Tashlin, whose background as a Warner Bros. Looney Tunes cartoon director suited Lewis's brand of humor, he starred in five more films, The Sad Sack (1957), Rock-A-Bye Baby (1958), The Geisha Boy (1958), Don't Give Up The Ship (1959) and even appeared uncredited as Itchy McRabbitt in Li'l Abner (1959). Lewis tried his hand at releasing music during the 1950s, having a chart hit with the song "Rock-a-Bye Your Baby with a Dixie Melody" (a song largely associated with Al Jolson and later re-popularized by Judy Garland) as well as the song, "It All Depends on You" in 1958. 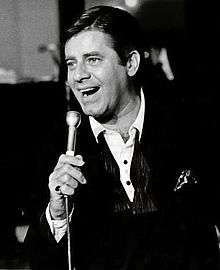 He eventually released his own album titled, Jerry Lewis Just Sings. By the end of his contract with producer Hal B. Wallis, Lewis had several productions of his own under his belt. In 1959, a contract between Paramount Pictures and Jerry Lewis Productions was signed specifying a payment of $10 million plus 60% of the profits for 14 films over a seven-year period. In 1960, Lewis finished his contract with Wallis with Visit to a Small Planet (1960), and wrapped up work on his own production, Cinderfella, which was postponed for a Christmas 1960 release, and Paramount, needing a quickie feature film for its summer 1960 schedule, held Lewis to his contract to produce one. Lewis came up with The Bellboy (1960). Using the Fontainebleau Hotel in Miami as his setting—and on a small budget, with a very tight shooting schedule, and no script—Lewis shot the film by day and performed at the hotel in the evenings. Bill Richmond collaborated with him on the many sight gags. Lewis later revealed that Paramount was not happy financing a 'silent movie' and withdrew backing. Lewis used his own funds to cover the $950,000 budget. During production Lewis developed the technique of using video cameras and multiple closed circuit monitors, which allowed him to review his performance instantly. His techniques and methods, documented in his book and his USC class, enabled him to complete most of his films on time and under budget. Lewis followed The Bellboy by directing several more films that he co-wrote with Richmond while some were directed by Tashlin, including The Ladies Man (1961), The Errand Boy (1961), It's Only Money (1962) and The Nutty Professor (1963). Lewis did a cameo in It's a Mad, Mad, Mad, Mad World (1963). Further Lewis films were Who's Minding the Store? (1963), The Patsy (1964) and The Disorderly Orderly (1964). Lewis directed and co-wrote The Family Jewels (1965) about a young heiress who must choose among six uncles, one of whom is up to no good and out to harm the girl's beloved bodyguard who practically raised her. Lewis played all six uncles and the bodyguard. On television, Lewis hosted two different programs called The Jerry Lewis Show. The first was a two-hour Saturday night variety show on ABC in the fall of 1963. The lavish, big-budget production failed to find an audience and was canceled after 13 weeks. Then, his second was a one-hour variety show on NBC from 1967 to 1969. By 1966, Lewis, then 40, was no longer an angular juvenile, his routines seemed more labored and his box office appeal waned to the point where Paramount Pictures new executives felt no further need for the Lewis comedies and did not wish to renew his 1959 profit sharing contract. Undaunted, Lewis packed up and went to Columbia Pictures, where he made Three On A Couch (1966), then appeared in Way...Way Out (1966) for 20th Century Fox followed by The Big Mouth (1967), Don't Raise the Bridge, Lower the River (1968) and Hook, Line & Sinker (1969). Lewis taught a film directing class at the University of Southern California in Los Angeles for a number of years; his students included Steven Spielberg and George Lucas. In 1968, he screened Spielberg's early film, Amblin' and told his students, "That's what filmmaking is all about." Lewis directed and made his first offscreen voice performance as a bandleader in One More Time (1970). He then produced, directed and starred in Which Way to the Front? (1970), his final released movie. He would then make and star in the unreleased The Day the Clown Cried (1972), which was a drama set in a Nazi concentration camp. Lewis rarely discusses the experience, but once explained why the film has not been released, suggesting litigation over post-production financial difficulties. However, he admitted during his book tour for Dean and Me that a major factor for the film's burial is that he is not proud of the effort. In 1976, Lewis appeared in a revival of Hellzapoppin' with Lynn Redgrave, but it closed on the road before reaching Broadway. After an absence of 11 years, Lewis returned to film in Hardly Working (1981), a movie which he both directed and starred in. Despite being panned by critics, the movie eventually earned $50 million. Lewis next appeared in Martin Scorsese's film The King of Comedy (1983), in which he plays a late-night television host plagued by obsessive fans, played by Robert De Niro and Sandra Bernhard. A few more movies Lewis appeared in included Cracking Up (1983) and Slapstick (Of Another Kind) (1984). In France, Lewis starred in both To Catch a Cop a.k.a. "The Defective Detective" (1984) and How Did You Get In?, We Didn't See You Leave (1984). Lewis states as long as he has control over distribution to those movies, they will never have an American release. Meanwhile, a syndicated talk show Lewis hosted for Metromedia in 1984 was not continued beyond the scheduled five shows. Lewis starred in the ABC televised drama movie Fight For Life (1987) with Patty Duke, then went on to appear in Cookie (1989). Lewis had a cameo in Mr. Saturday Night (1992) while guest appearing in an episode of season one of Mad About You, as an eccentric billionaire. Lewis made his Broadway debut, as a replacement cast member playing the devil in a revival of Damn Yankees, choreographed by future movie director Rob Marshall (Chicago). while also starring in the film Arizona Dream (1994), as a car salesman uncle. Lewis then starred as a father of a young comic in Funny Bones (1995). In March 2006, the French Minister of Culture awarded Lewis the Légion d'honneur, calling him the "French people's favorite clown". Lewis has remained popular in the country, evidenced by consistent praise by French critics in the influential magazine Cahiers du Cinéma for his absurd comedy, in part because he had gained respect as an auteur who had total control over all aspects of his films, comparable to Howard Hawks and Alfred Hitchcock. Liking Lewis has long been a common stereotype about the French in the minds of many English-speakers, and is often the object of jokes in Anglosphere pop culture. "That Americans can't see Jerry Lewis's genius is bewildering," says N. T. Binh, a French film magazine critic. Such bewilderment was the basis of the book Why the French Love Jerry Lewis (2001), by Rae Beth Gordon. In 2012, Lewis directed a musical theatre version of The Nutty Professor (with score by Marvin Hamlisch) at the Tennessee Performing Arts Center in Nashville from July 31 to August 19 over the summer. Lewis appeared in the Brazilian film Till Luck Do Us Part 2 (2013), then next in a small role in the crime drama The Trust (2016). Lewis made his first comeback lead role in Max Rose (2016). In an October 6, 2016 interview with Inside Edition, Lewis acknowledged that he may not star in any more films given his advanced age, while admitting, through tears, that he was afraid of dying as it would leave his wife and daughter alone. Lewis kept a low political profile for many years, having taken advice given to him by his friend, President John F. Kennedy, who told him "Don't get into anything political. Don’t do that because they will usurp your energy". Lewis also once stated that political speeches "did not belong" at the Oscars. In a 2004 interview, Lewis was asked what he was least proud of, to which he answered politics--not his, but the world’s. He lamented citizens' lack of pride in their country, stating, "President Bush is my president. I will not say anything negative about the president of the United States. I don't do that. And I don't allow my children to do that. Likewise when I come to England don't you do any jokes about 'Mum' to me. That is the Queen of England, you moron". In a December 2015 interview on EWTN's World Over with Raymond Arroyo, Lewis expressed opposition to the United States letting in Syrian refugees, saying "“No one has worked harder for the human condition than I have, but they’re not part of the human condition”. In the same interview, he criticized president Barack Obama for not being prepared for ISIL, while expressing support for Donald Trump, saying he would make a good president because he was a "showman". He also added that he admired Ronald Reagan's presidency. Lewis has suffered from a number of illnesses and addictions related both to aging and a back injury sustained in a comedic pratfall from a piano while performing at the Sands Hotel on the Las Vegas Strip on March 20, 1965. The accident almost left him paralyzed. In its aftermath, Lewis became addicted to the painkiller Percodan for thirteen years. He says he has been off the drug since 1978. In April 2002, Lewis had a Medtronic "Synergy" neurostimulator implanted in his back, which has helped reduce the discomfort. He is now one of the company's leading spokesmen. In the 2011 documentary Method to the Madness of Jerry Lewis, Lewis said he suffered his first heart attack while filming Cinderfella in 1960. In December 1982, Lewis suffered another heart attack. En route to San Diego from New York City on a cross-country commercial airline flight on on June 11, 2006, he sustained a minor heart attack . It was discovered that he had pneumonia as well as a severely damaged heart. He underwent a cardiac catheterization and two stents were inserted into one of his coronary arteries, which was 90% blocked. The surgery resulted in increased blood flow to his heart and has allowed him to continue his rebound from earlier lung problems. Having the cardiac catheterization meant canceling several major events from his schedule, but Lewis fully recuperated in a matter of weeks. In 1999, his Australian tour was cut short when he had to be hospitalized in Darwin with viral meningitis. He was ill for more than five months. It was reported in the Australian press that he had failed to pay his medical bills. However, Lewis maintained that the payment confusion was the fault of his health insurer. The resulting negative publicity caused him to sue his insurer for US$100 million. Lewis has had prostate cancer, diabetes, pulmonary fibrosis, and a decades-long history of heart disease. Prednisone treatment in the late 1990s for pulmonary fibrosis resulted in weight gain and a noticeable change in his appearance. In September 2001, Lewis was unable to perform at a planned London charity event at the London Palladium. He was the headlining act, and he was introduced, but did not appear. He had suddenly become unwell, apparently with heart problems. He was subsequently taken to the hospital. Some months thereafter, Lewis began an arduous, months-long therapy that weaned him off prednisone and enabled him to return to work. On June 12, 2012, he was treated and released from a hospital after collapsing from hypoglycemia at a New York Friars' Club event. This latest health issue forced him to cancel a show in Sydney. Throughout his entire lifetime and prolific career, Lewis was a world renowned humanitarian who has supported fundraising for research into muscular dystrophy. Until 2011, he served as national chairman of and spokesman for the Muscular Dystrophy Association (MDA) (formerly, the Muscular Dystrophy Associations of America). Lewis began hosting telethons to benefit the company from 1952 to 1959; after that, every Labor Day weekend from 1966 to 2010 he hosted the live annual Jerry Lewis MDA Telethon. Over nearly half a century he raised over $2.6 billion in donations for the cause. On August 3, 2011, it was announced that Lewis would no longer host telethons and is no longer associated with the Muscular Dystrophy Association. Then on May 1, 2015, it was also announced that in view of "the new realities of television viewing and philanthropic giving", the telethon was being discontinued. In early 2016, Lewis made an online video statement for the organization on its website, in honor of its rebranding, marking his first appearance and comeback in support of the Muscular Dystrophy Association since his final Labor Day Telethon in 2010 and the ending of his tenure as national chairman in 2011. 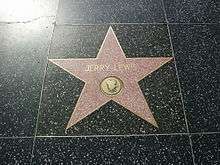 In 1969, Lewis agreed to lend his name to "Jerry Lewis Cinemas", offered by National Cinema Corporation as a franchise business opportunity for those interested in theatrical movie exhibition. Jerry Lewis Cinemas stated that their theaters could be operated by a staff of as few as two with the aid of automation and support provided by the franchiser in booking films and in other aspects of film exhibition. A forerunner of the smaller rooms typical of later multi-screen complexes, a Jerry Lewis Cinema was billed in franchising ads as a "mini-theatre" with a seating capacity of between 200 and 350. In addition to Lewis's name, each Jerry Lewis Cinema bore a sign with a cartoon logo of Lewis in profile. Initially 158 territories were franchised, with a buy-in fee of $10,000 or $15,000 depending on the territory, for what was called an "individual exhibitor". For $50,000, the Jerry Lewis Cinemas offered an opportunity known as an "area directorship", in which investors controlled franchising opportunities in a territory as well as their own cinemas. The success of the chain was hampered by a policy of only booking second-run, family-friendly films. Eventually the policy was changed, and the Jerry Lewis Cinemas were allowed to show more competitive films, but after a decade the chain failed. Both Lewis and National Cinema Corp. declared bankruptcy in 1980. 1978: Award for Greatest Public Service Benefiting the Disadvantaged, an award given out annually by Jefferson Awards. 2006: Commandeur, Ordre national de la Légion d'honneur, France. 2013: Honorary Member of the Order of Australia (AM), For service to the Muscular Dystrophy Foundation of Australia and for his long-time humanitarian contribution to those affected by the disorder. ↑ "Jerry Lewis". Encyclopædia Britannica. Retrieved June 26, 2010. ↑ "Jerry Lewis Film Reference bio". Filmreference.com. Retrieved 2011-10-23. ↑ "The Official Jerry Lewis Comedy Museum and Store". Jerrylewiscomedy.com. Retrieved 2011-10-23. 1 2 Lewis, Jerry (2006). Dean and Me. Three Rivers Press. ISBN 978-0767920872. ↑ Clark, Mike (October 25, 2005). "'Dean & Me' really is a love story". usatoday.com. Retrieved January 15, 2013. ↑ "1976 MDA Telethon – Jerry Lewis, Frank Sinatra & Dean Martin Reunite". ↑ Lewis, Jerry; Kaplan, James (October 23, 2005). "'We Had That X Factor' (Dean Martin and Jerry Lewis)". Parade. Retrieved 2008-11-07. ↑ Joseph McBride (1997). Steven Spielberg – A Biography. New York: Simon & Schuster. p. 168. ISBN 978-1604738360. ↑ "Hellzapoppin 1976 revival, closed on the road before reaching Broadway". Broadwayworld.com. Retrieved 2011-10-23. ↑ "Jerry Lewis in Top French Honour". BBC News. March 16, 2006. Retrieved 2008-05-14. ↑ Cecil Adams (October 1, 1999). "Do the French really love Jerry Lewis?". The Straight Dope. Retrieved May 4, 2015. 1 2 Poirier, Agnes C. (May 19, 2013). "Le Grand Jerry Lewis". The New York Times. Retrieved May 21, 2013. ↑ Ng, David (August 2, 2012). "Jerry Lewis' 'Nutty Professor' musical opens in Nashville". Los Angeles Times. Retrieved August 18, 2013. ↑ McNary, Dave (May 15, 2009). "Jerry Lewis To Star In 'Max Rose'". Variety. Retrieved 2009-06-15. ↑ "Max Rose (2010)". Internet Movie Database. Retrieved May 4, 2015. 1 2 "Who is Jerry Lewis". Digilander.libero.it. Retrieved 2011-10-23. ↑ "Jerry Lewis". CBS News. Retrieved May 4, 2015. ↑ Pore-Lee-Dunn Productions (July 31, 1946). "Gary Lewis and the Playboys". Classicbands.com. Retrieved 2011-10-23. ↑ "Portrait of Jerry and Patti Lewis with Son". corbisimages.com. April 12, 1956. Retrieved January 9, 2012. ↑ "Joseph Lewis". contactmusic.com. January 7, 2010. Retrieved January 13, 2010. 1 2 3 4 Clark, Mike (August 29, 2002). "Jerry Lewis Tells It Like It Is – And Was". USA Today. Retrieved March 6, 2009. 1 2 3 4 "A Moment With ... Jerry Lewis, Comedian/Entertainer/Philanthrophist". Seattle Post-Intelligencer. April 10, 2003. Retrieved March 7, 2009. 1 2 "Jerry's Story". Medtronic.com. May 17, 2011. Retrieved 2011-10-23. ↑ "A&E Profiles The Manic Genius of Jerry Lewis". Fort Lauderdale Sun-Sentinel. August 22, 1996. Retrieved March 16, 2015. ↑ "The Astounding B Monster | Cult". Bmonster.com. Retrieved 2011-10-23. ↑ Sciretta, Peter (June 14, 2006). "Jerry Lewis Suffers Heart Attack". /Film. Retrieved 2009-06-15. ↑ Price, Jenna (June 11, 2000). "Jerry Lewis Calls The Shots Now That He's Paid His Bill". The Canberra Times. ↑ Henkel, John (December 1994). "Prostate Cancer: New Tests Create Treatment Dilemmas". FDA Consumer. BNET. Retrieved 2009-06-16. ↑ Kenneally, Tim (June 13, 2012). "Jerry Lewis Rushed to Hospital After Friars Club Collapse (Report)". Chicago Tribune. Reuters. Retrieved June 13, 2012. ↑ "Jerry Lewis no longer MDA's national chairman". MSNBC. August 4, 2011. 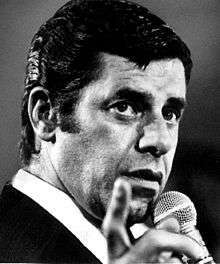 ↑ "Jerry Lewis wows ACTU crowd". ABC News. June 24, 2011. ↑ Brian Stelter (August 4, 2011). "Jerry Lewis Dropped From Labor Day Telethon". The New York Times. Retrieved May 3, 2015. ↑ "Jerry Lewis Screwed Again by MDA: They're Using His Old Clips With A List Stars to Promote Themselves". Showbiz411. July 27, 2014. Retrieved 2014-08-23. ↑ "Telethon that Jerry Lewis memorably ran pulls plug". St. Louis Post-Dispatch. Associated Press. May 1, 2015. Retrieved 2015-05-04. ↑ Connelly, Sherilyn. "Bad Ideas from the 1970s: Jerry Lewis Cinema Franchises Were a Nutty Disaster". SF Weekly. Retrieved October 19, 2011. ↑ "Join Jerry Lewis (advt.)". Life. December 31, 1971. p. 75. Retrieved 2011-10-23. ↑ ccrouch. "Fantasy & Failure With Jerry Lewis Cinemas". Cinelog.org. Retrieved October 19, 2011. 1 2 3 4 5 6 7 8 "Jerry Lewis Awards and Nominations". Internet Movie Database. Retrieved May 4, 2015. ↑ "National Winners | public service awards". Jefferson Awards.org. Retrieved 2014-08-23. ↑ "10 of the Top Male Comics With Their Own Show". I Am Entertainment. September–October 2013. p. 20. Retrieved May 4, 2015. ↑ "Goldene Kamera 2005: Ehrenpreis Jerry Lewis, Hörzu" (in German). Retrieved October 11, 2012. ↑ "Veteran Actor Jerry Lewis To Receive Humanitarian Award at Oscars". Xinhua News Agency. February 23, 2009. Retrieved May 4, 2015. ↑ "Honorary Member of the Order of Australia (AM)" (PDF). Special Honours Lists. Governor-General of Australia. Retrieved January 2, 2014. Everybody Loves Somebody Sometime (Especially Himself): The Story of Dean Martin and Jerry Lewis by Arthur Marx, New York: Hawthorne Books, 1974, ISBN 978-0-8015-2430-1. That Kid: The Story of Jerry Lewis by Richard Gehman. New York: Avon Books, 1964. Wikimedia Commons has media related to Jerry Lewis.